Windows 7 Boot Updater is a program that makes it easy to update the Windows 7 boot animation and text. The program loads a folder containing all the frames as PNGs, GIFs, BMPs, TIFs, or JPEGs images. The files will be played in alphabetical order. If you are numbering them, use the same number of digits for all numbers (e.g. 001, 002, …, 103, 105). For ‘historical’ reasons, the animation can also be a folder containing a single BMP named “activity.bmp” that is 200x21000px. Transparency (in PNGs and GIFs) is supported (except when a message is behind the animation). It you want no animation, set the static image as a single pixel image that is transparent. Videos and animations, such as GIF, AVI and MPEG files, can be converted into a sequence of PNGs using ffmpeg. I have made a utility to make this very simple: video2png. Start the application, the main interface of Windows 7 Boot Updater allows to modify the boot screen (Booting tab) and the resume from hibernation screen (Resuming tab). Each tab allows to modify the boot screen text, background color, animation (static image or animation), etc. 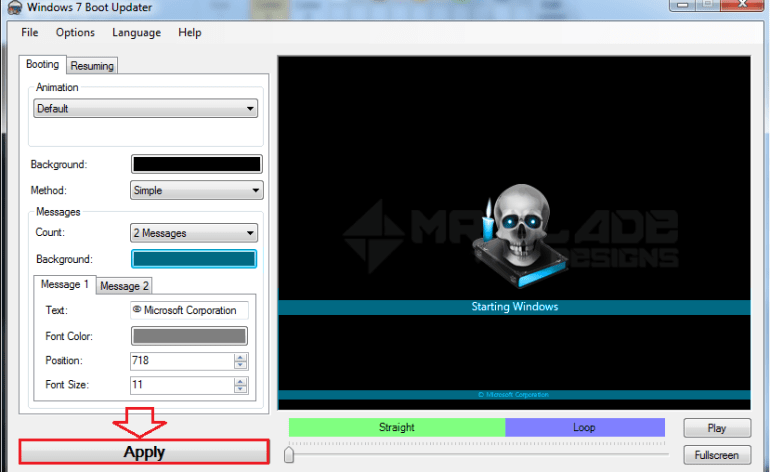 Text for “© Microsoft Corporation” and “Starting Windows” can be modified under the Message 1 and Message 2 tabs. When you finish your customization, click Apply.